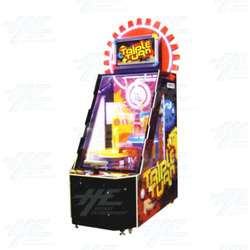 Triple Turn is a ticket redemption arcade machine from Bandai Namco. A family friendly ball game, Triple Turn requires players to pull a level to drop a ball and time it to fall down the one of the 3 tubes which are worth varying points. There are 3 levels of gameplay and a bonus hole that reveals an extra 3 balls. A Jackpot option is also available for players to win a major ticket payout. Bright and full of flashing lights, this attractive machine is simple but challenging and would make an excellent addition to any arcade location.